Hometown Markets open for business at 8 AM everyday. Monday through Saturday, we close at 9 PM. On Sundays we close at 7 PM. 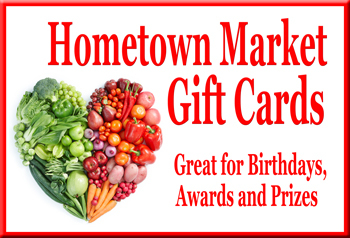 Purchase Hometown Market Gift Cards at Customer Service at any Hometown Market. Available in any denomination, never expire, always useful and appreciated. Copyright 2014-, Hometown Markets, McAneny Brothers Inc.